Opt for a little drama with the introduction of this four-light geometric pendant to an entry or dining area. Featuring an open cube frame in a bronze finish, the contemporary design offers four lights at its center. Its open frame adds a touch of geometry and is adorned with decorative details sure to draw the eye. 16 1/2" high x 14" wide. Canopy is 5" wide x 2 1/2" high. Weighs 7.48 lbs. Comes with one 6" and three 12" downrods. 12 1/2-feet of brown cord. Not slope ceiling adaptable. 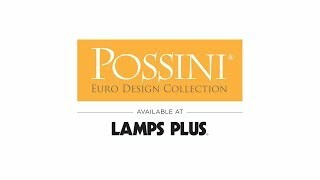 Carrington four-light entry pendant by Possini Euro Design®. A clear glass shade highlights the refined style of this Kimball three-light pendant.